So, the other day I moved in with my boyfriend for 5 days. Why 5 days? Well, because his parents went away so we had to house sit. Everything was going well (well, okayish - when told to get chicken he got turkey and was promptly sent to Sainsburys) on the first night. All was good. Wake up the next day, go to get ready for work and here comes my issue - I forgot my make up. So, first of all is your base. 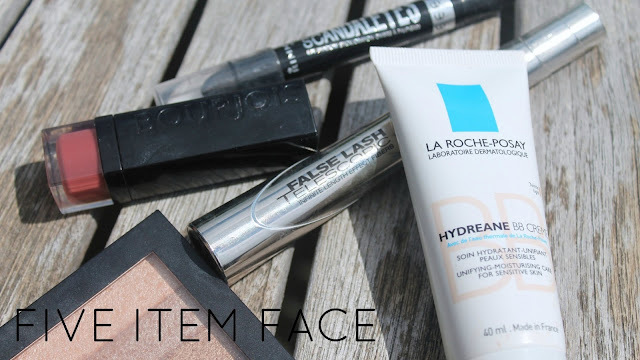 For me the idea before the five item face is that i won't be using moisturiser or primer, so on goes the BB cream - in this case it is La Roche Posay Hydreane BB Cream in Light. It's thick enough to be mistaken for foundation, but light to wear so it's a win all round. Next up is my 17 Glow Shimmer Brick - this is a highlighter/bronzer in one and I cannot live without this, and in this case it takes care of two areas in one product. Next I go to the eyes... Some sort of eyeliner is a must for me, and recently I've been reaching for Rimmel's Scandaleyes Eyeshadow Crayon in Black. I use it as a liner on my waterline and with a quick smudge you have some colour (well, black). Then I pop on the mascara - I do not leave the house without this on, it's just a golden rule for me. Lately I've been loving L'Oreal Telescopic Mascara in black. It's long lasting and lengthens fantastically. Then I finish off the look with my lips. Here I've used Bourjois Rouge Edition Lipstick in Shade 4. Long lasting, moisturising and the perfecct everyday colour. This is pretty much my everyday work face - just minus the primer, moisturiser, blusher, eyeshadow, concealer, lip scrub and gloss... So actually quite a lot. But I have to say, this five item face doesn't do too badly! What's you five item face?